Is A Turn in Growth At Hand? Is A Turn At Hand? If the U.S. expansion makes it to March, it will match the 1990s expansion as the longest on record. But the last few months have seen a slowing in global growth and a pickup in market volatility. Even though the current data flow remains mixed, global growth could improve because worries over trade and tightening monetary policy have faded and policy changes suggest stabilization. Our WCA Fundamental Conditions Barometer (chart, below), which measures broad changes in the growth outlook, improved slightly in the past month, but remains at levels suggesting some continued weakness. 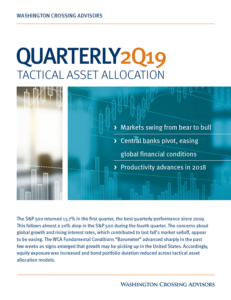 Equity exposure in CONQUEST Tactical Asset Allocation portfolios was increased to a modest underweight on account of the recent uptick in our barometer’s forecast path. Global economic trends remain weak, especially Europe and parts of Asia. The International Monetary Fund recently lowered its 2019 global growth forecast to 3.5%, below our 3.7% expectation. An leading index of Chinese manufacturing, known as the China Manufacturing Purchasing Managers Index, has been below 50 for three months. European business confidence and output has also slumped in recent months. All-in-all, the global economy appears far less robust than a year ago. News that the United States will delay an increase in tariffs on Chinese goods, citing “significant progress” on talks, also helps lift some uncertainty. Additional tariffs on $200 billion of Chinese goods had been scheduled to rise to 25% from 10% on March 1st, but President Trump effectively signaled a truce amid what he called “substantial progress” on talks. 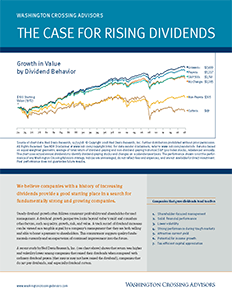 The dialing back of two significant market overhangs — central bank tightening and trade — contributed to a better tone for the stock market in January and February. Should risk appetite remain solid, and global policy supportive, it could lead to a second half lift in global growth. The most important reason global growth could improve is because policy changes support stabilization ahead. Since last summer, the Federal Reserve moved from talking about needing to hike rates further to cool the economy to a need for “patience.” The central bank also announced that they intended to stop unwinding their balance sheet later this year than in the middle of next year, as markets were expecting. This amounts to an about-face by the Federal Reserve and makes it easier for other global central banks to follow suit. The European Central Bank (ECB) has already signaled a willingness to maintain accommodation amidst slower European growth, weakening housing prices, and ongoing Brexit negotiations. The fact that central banks are moving to ease and global leaders are moving to come together on issues such as trade underscore the slippage in global conditions that began last year. 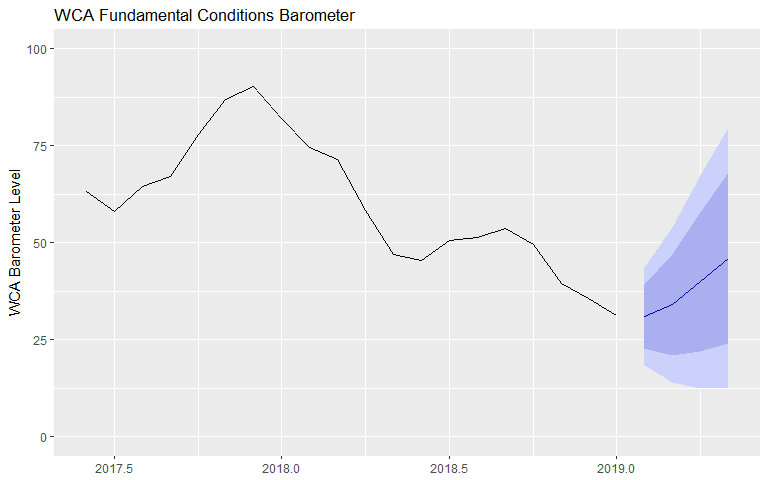 Our WCA Fundamental Conditions Index (graph, below), improved slightly in the last month in anticipation of some improvement ahead. We note, however, that the level remains consistent with a somewhat challenged environment. While we are hopeful that the steps taken in recent weeks gain traction and lead to a pickup later this year, we are mindful that slower business spending and expected profit growth, still weak industrial production, and potential for negative shocks, notably Brexit and China trade negotiations, could impede progress. So it is clear that although the current data flow remains mixed, global growth could stage a second half comeback for two main reasons. First, worries over trade and tightening monetary policy have faded. But most importantly, policy changes suggest stabilization and support that could foster a turnaround. While not out of the woods yet, some early signs of stabilization are creeping into our outlook and justify a slightly less bearish tactical posture. When will the global expansion end and will the current one reach a record? It is hard to know for sure, but our analysis of the data leads us to believe we are at an important crossroads.